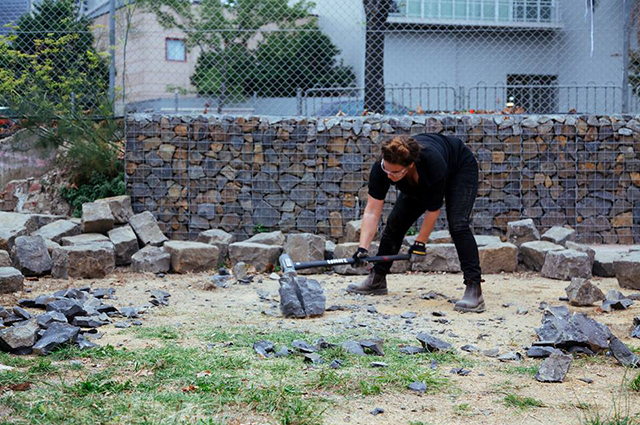 'Listening to Stones', 2015, performance with two tonnes of 17th-century hand-cut bluestone. Amy-Jo Jory is a Melbourne based artist, writer and curator. For over a decade she has exhibited widely in Australia and New Zealand, and has been a director of artist run initiatives in Melbourne and Dunedin. Gaining a Masters of Fine Art by Research from the Victorian College of the Arts, she has been the recipient of postgraduate scholarships and prizes, and her work is held in both the Vulcan Steel Collection and private collections worldwide. Amy-Jo also makes functional ceramics and jewellery. Compelled by the intersections between gender, sexuality, class, and institutional power, Jo speaks to a long feminist history of connecting personal narratives with broader political and social structures—her work is a kind of ontology of the self, implementing life experiences as an art.